This is so so simple to throw together, which is great for a Monday, or any weeknight, dinner. It also reheats nicely, so it’s perfect to have for lunch the next day, and everyone at work will have lunch-envy. Cook pasta in a stock pot according to package directions. Reserve 1 cup pasta water, then drain the rest. Meanwhile, place butternut squash cubes and ¼ cup water in a microwave safe bowl. Microwave 4-5 minutes, until very tender. Place cooked squash in a blender with reserved pasta water and puree until very smooth. Heat stock pot to medium heat. Add bacon pieces and cook, stirring regularly, until crispy. Remove bacon with a spoon and place on a paper towel. Drain most of the bacon fat. Pour pureed squash into the stock pot. Stir in cooked spaghetti. Season with salt, pepper and cayenne pepper. Remove pot from the heat. 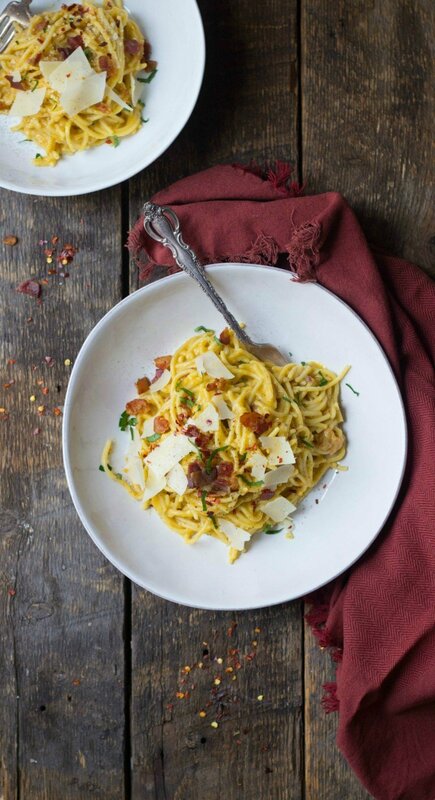 In a small bowl, whisk together egg yolks and ½ cup grated Parmesan. Stir egg yolk/Parmesan mixture into the carbonara. Stir in most of the bacon crumbles. Taste and adjust seasoning, if necessary. Stir in chicken stock if mixture is too thick. Serve in bowls and top with remaining Parmesan, bacon crumbles and chopped parsley.